Balanced diet? Quite! This can be a nice poster for healthy eating, if only the pork werenâ€™t fried. Still, it was filling and satisfying—always my main consideration for packing lunch. The pepper fried pork is a quick, fried pork dish. Taking a porkloin steak, I dusted it with salt and lots of pepper, then fried on both sides. The pork was sliced before adding to the box to make it easier to handle come lunch time. On the side is a small amount of bokchoy sautÃ©ed lightly until wilted. Added more as a bento filler rather than a serious side, it reminded me that I’m all out of tomatoes, quail eggs and umeboshi (Japanese pickled plums), my classic space fillers. On the right are straw mushrooms and flower-shaped carrots sautÃ©ed in a little oyster sauce. Healthy right? Then to complete the lunch, steamed rice dusted with furikake, a Japanese rice seasoning. Oh and a little tonkatsu sauce in the Hello Kitty sauce cup to dip the pepper fried pork in. Oh man! This is so cute! I love the carrot flowers and the pretty rice pixie dust. As you know i am a great fan of your site, i look forward to seeing all the new things you make for the tiffin. why have you changed your photo format, the last couple of photos look different from the earlier ones , the one with close ups look really good…you should use the earlier format..
can you put up links of others who make great bento boxes like you so that someone like me will be inspired. Thanks 😀 Carrots are more fun to eat when they’re so flowery shaped. At least for me, hehehe. Thanks! 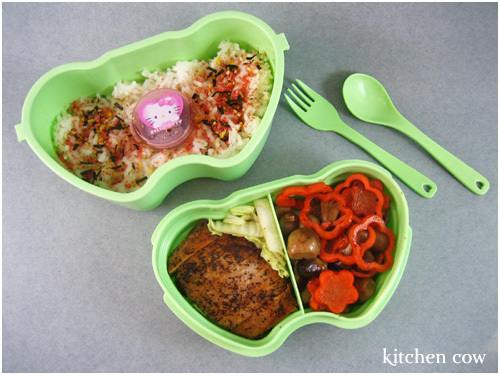 I do have a list of other bento bloggers uploaded on the site, it’s on the menu bar at the right, labeled linkage. As to the photos, I usually decide spur off the moment what angle and how close to take the pic. A lot of times, it depends on the shape of the box and how the final photo composition will look like when I’m done. Lately, the boxes I’ve been using lend themselves more to wider shot hence the shot selection. I’ll remember to consider tighter shots next time.